Plugins are programs designed to modify or enhance WordPress’s core functionality. One of the plugins, Akismet, needs a key to work. It is a very important plugin, probably the best one to install first. It takes care of the spam, because if you don’t have Akismet activated you will notice an awful lot of junk comments. In the above image there are a couple of menu items that appear only because its plugin is activated. In the top menu is Add Event, placed there by a calendar plugin. In the left menu is another item placed there by the Nano Plugins. Before installing a plugin, think about your website and how you want it to look and behave in addition to the core functionality provided. Then, search for the proper plugin in the WordPress Directory. Much is offered. You’ll find that these are mostly bulletproof programs written by programmers to do things in a specific way. If you want things to be done differently, you can modify their code, or create a plugin of your own from scratch. Either way, you will need to become familiar with the PHP programming language. Most people have never created a plugin. How difficult do you think it is? Do you know where to begin? Alongside its Name, there are a Description, Version number, Author with a hyperlink to the Author URI, and the label “Visit plugin site” which has a link to the Plugin URI. In the next post you’ll see where this plugin and its information is located. 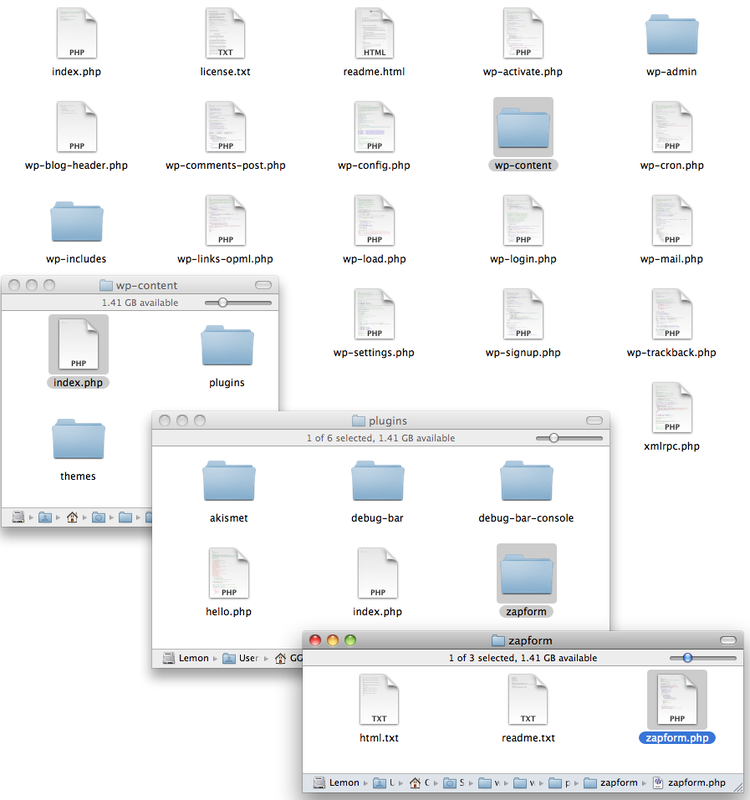 These are the files you received from wordpress.org. 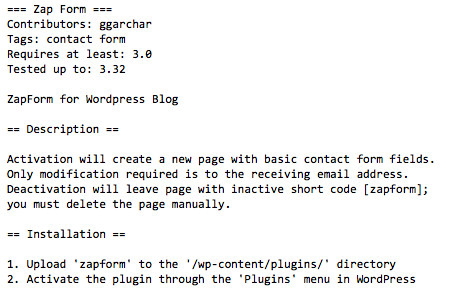 The zapform folder is the plugin containing the zapform.php file. It is an ordinary text file with the file name extension telling the server to interpret it as a PHP program. That’s it?! If you understand PHP then you can see that it does nothing. All the text is within a comment. To make this file into a plugin, the only thing required is the Plugin Name. 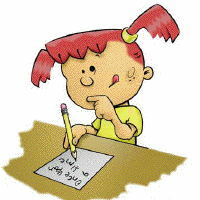 WordPress reads the name from the text and also the other information found in the comment to get the Description, Version number, Author with Author URI, and the Plugin URI. This is the information we saw earlier on the Installed Plugins page. Other than that, there is no executable php code here to do anything. So, lets get this plugin to do something, such as create a page. The first line, register_activation_hook asks to run the createPage function when the plugin is first activated. In the createPage function, the important command is wp_insert_post. 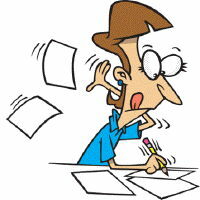 The parameter it takes is an array with information about the page. $page is an array with five elements: post_content, post_parent, post_status, post_title, and post_type. These are the names of the elements of the $page array. The most interesting one of the five elements is post_content. 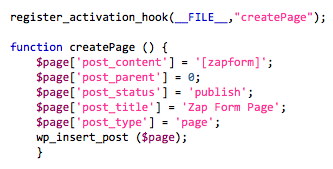 The text string [zapform] will be the only content we put into this newly created page. 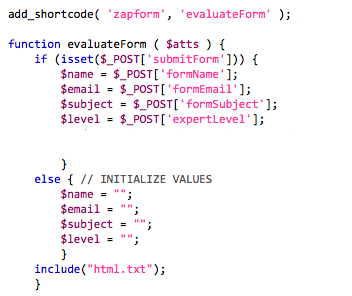 The text string [zapform] does nothing until we make it into a shortcode (see Add Shortcode below). 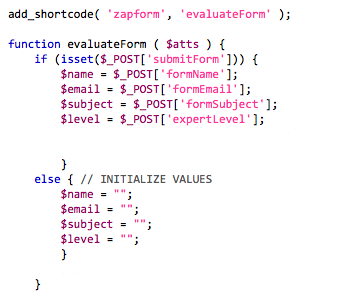 When the shortcode [zapform] is found in a post or page or even in the text field of a widget, the function evaluateForm is executed. So far, the submitForm value has not been set, so the only thing that happens at first is the other four array values get initialized. Next we’ll add a line of code to include the HTML file. What is in the html.txt file? 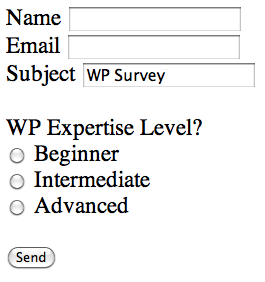 We’ve pre-set the value for the Subject line to “WP Survey3”. 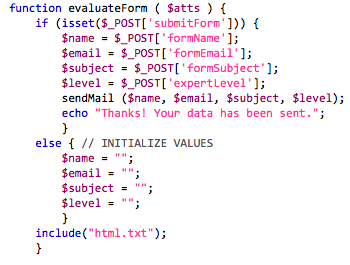 Notice that the value for the submit type of input is pre-set to “Send”. This is the label that will appear on the button of the form. Like the other values, it can be any text string. 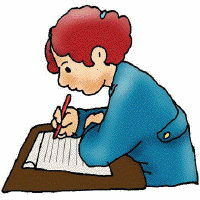 The blanks can be filled in and the pre-set entry in the Subject text box can be changed by the user. After pressing the Send button, the user needs to be told that the email has been sent. Next. 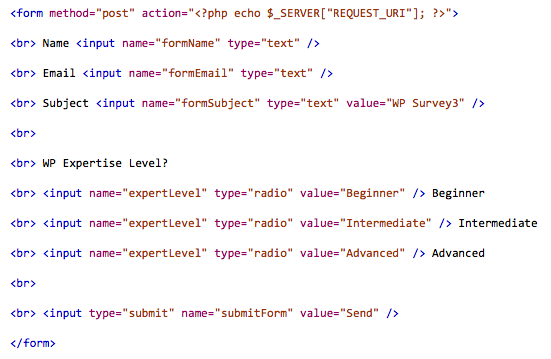 The echo command is a PHP language construct that outputs the text strings. The text strings will appear with the form, anyplace the active shortcode is being used. BTW, it might also be important to filter the other text fields from passing malicious code. The period is a concatenation operator. The .= is an append operator. This demonstrates a very simple use of the mail command with three parameters. 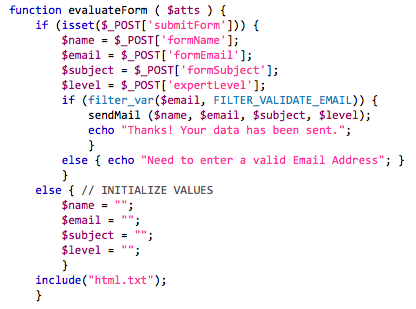 A fourth parameter could be added for the email header. To make your entry in the plugin browser most useful, each plugin should have a readme file named readme.txt that adheres to the WordPress plugin readme file standard.